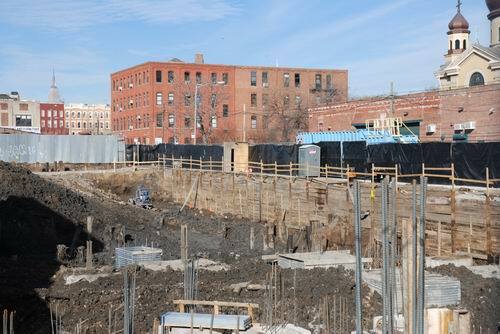 As we noted yesterday, the reason we fell into a sinkhole on N. 11th Street in Williamsburg was because we were having another look at the site of the McCarren Park Mews condos on the oily site we like to call the Roebling Oil Field. What we found was that the coverup cleanup is almost done. 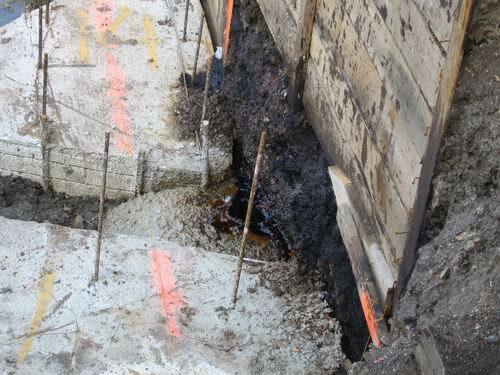 A foundation is being poured and vast amounts of soil are being laid over the oil beneath. We've said before and we've said again that we're not oil cleanup experts. So, what's going on here may be entirely appropriate, even if we'd personally look to a more pristine site for our dream home. What surprised us, though, is that oil is still oozing into the site from the north, which leads us to conclude that, perhaps, the source of the pollution is in that direction. The shot below shows the general progress of work at the Roebling Oil Field. We were on the verge to buy an apartment at 11th & Roebling. We decided not to go further. Thanks for your blog and all the really precious info you provided.